Situated in a Nature Reserve at St. Marien, a farming village in the Creuse department of limousim. and has 5 acres of enclosed garden. Swimming pool and small children's paddling pool . Tables and chairs provided and plenty of garden games, , swings. Secure private parking. Goodsize airy rooms. Electric heating upstairs . 1 and 2 bedrooms have double beds and bedroom 3 has twin beds. Available in lounge double sofa bed. All bedlinen, pillows and duvets are provided. Goodsize shower room with wash hand basin and wc. Full size cot and bedlinen is available. Travel cot / playpen, baby bath, potty, Nappy bags, changing mat and Baby Monitor, sterilizer, Spare bottles and bottle brush, children's dish set. Safety plug covers, Spare Those dummies for emergencies' spare bibs are also available. All upstairs windows have childlocks and baby gates on stairs. Lounge with wood beams is tastefully decorated and comfortably furnished. TV with English freeview channels and video / dvd. Woodburner .Kitchen / diner is light and airy. Fully fitted Kitchen has ample storage and is well equipped with kitchen utensils and appliances wireless broadboadband available Property has high ceilings and wooden floors making it an excellent retreat from the midday sun. The three bedrooms and shower room are on the first floor leading off from the very unusual hallway Which still maintains it's original features. There is a ceiling fan in lounge. There are radio alarm clocks and bedside lamps in the two double bedrooms. There is a trouser press in the lounge. Books and games are provided on units in lounge. Good size football table, snooker table top .Wireless Internet access A welcome pack containing the basics of tea, coffee sugar, milk, and a bottle of red and white wine and a carton of orange juice and crossiants will be provided on your arrival. We aim to make your stay as comfortable as is possible. Rabbits can be seen playing close to gite and occassionaly a deer will appear out of the hedges. Many ducks will go flying by as well as owls,other birds of prey BIRD WATCHERS PARADISE . 65 Species recorded and some rare eg Booted Eagle, Icterine Warbler and bats. Beautiful dragon flys hover around the pool. Crickets can be heard singing in the evening and sometimes during the day. I live here with my husband Ken and our dog Patch a springer spaniel puppy who just loves people and is always happy to come and say hello . We also have Mangi our Senegal parrot . We moved here from Monmouthshire in Wales . We bought our house here as it is set in a beautiful rural setting .We have a lovely restful slow pace of life here but although we are situated out of the village it is easy to get within a short distance to all amenities . Within a short distance there is so much going on for all age groups . We love to sit in the evening having a glass of wine (which is good but cheaper here in France ) with maybe some nice local cheese and watching the most beautiful sunsets .If we are lucky a Red Squirrel or a deer may pop it's head out to say "Bonsoir " The garden is very child friendly with lots of enclosed safe lawns for them to play, run around , squeal and shout and just enjoy them selves . Shower room with good-sized shower cubicle. Wash basin and WC. Fully fitted Kitchen/Diner has ample storage and is well equipped with kitchen utensils and appliances: washing machine, Dishwasher , Fridge freezer ,electric cooker full size , Microwave, Dining area is light and airy. Highchair Available. Nearby at La Chatre there is a 18-hole championship golf course. No Handicap required Concession for over 60's. Also Gouzon about 20 minuites away . only other user is very occasionally the owner in the late evening . Notes on accommodation: Very Child friendly : The following are available for your convienience -:Baby bath, potty, Nappy bags, changing mat and Baby Monitor, sterilizer, Spare bottles and bottle brush, children's dish set. Safety plug covers, Spare dummies for emergencies' spare bibs are also available. All upstairs windows have childlocks and baby gates on stairs top and bottom. A welcome pack containing the basics of tea, coffee sugar, milk, and a bottle of red and white wine and a carton of orange juice will be provided on your arrival. We aim to make your stay as comfortable as is possible. NO smoking inside property Pets will be considered inquire with details. Outside: The large garden offers many activities such as swings , badminton, balls and rackets The fenced in and alarmed pool is 10mx5m and has been installed in a part of the garden that catches the sun all day. It has a patio area and a decking area with sun beds surrounding a large paddling pool filtered. Rabbits can be seen playing close to gite and occasionally a deer will appear out of the hedges. Many ducks will go flying by as well as owls,other birds of prey bird watchers paradise . 65 Species recorded and some rare eg Booted Eagle, Icterine Warbler and bats. Beautiful dragon flys hover around the pool. Crickets can be heard singing in the evening Cleaning / Towels / Linen / Maid service: All bedlinen and duvets are provided Towels are provided but you may like to bring your own for the pool Bed linen can be provided for the cot. The property was ideal for us and the outside space absolutely perfect as it was huge. Children and dogs could run around to their hearts content. The gite description matched reality except there was no children's pool, but that was not too important. Only wished the weather lived up to the same standard as we had picked the only 2 poor weeks of the summer! The owners were both very friendly and helpful. We took childrens paddling pool away as it was never used . We found the property easily and arrived to a warm welcome from the owners, Jeanette pointed out all the necessaries before leaving us to settle and unpack. There was a welcome pack provided and essentials in the kitchen (milk, tea etc). 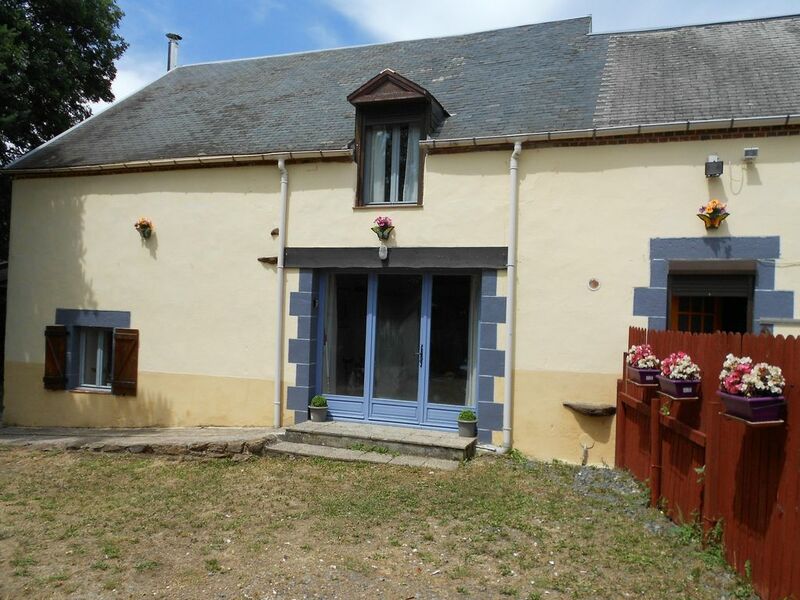 The Gite has 3 well sized bedrooms with plenty of storage space, a large lounge area and a well equipped kitchen/diner. Outside space was plentiful, with a large garden & lawn, a BBQ and a well maintained family sized swimming pool. The property owners were more than happy to recommend places to go and where to eat, their knowledge of the area is very good and a tourist guide book is available in the Gite. Nous avons passé des très bons moments en famille. Les propriétaires sont très gentil. Les jeunes ont bien profité de la piscine. Treignat (Herculant) Swimming lake. About 12 km (10 MINUTES by car ) away there is a really nice lake ,open to the public. There is a small beach with childrens slides and swings. A cafe and bar. fishing is permitted . There is a similar one thirteen minutes from the gite at siddalles which has a swimming area with pedalo's and canoes and also has a resturant and many picnic tables. Fishing available . A wonderful pleasent place to spend many a happy hour or two. Fly to Limoges Bellegarde airport. The area is ideal for a peaceful holiday with something for everyone's tastes. The nearest main town is: Boussac is the small historic town with a chateau to visit and offers, restaurants, cafes, banks and various shops. Prevranges is four minuites by car and has a lovely resturant and a bistro . stayed here and the town and countryside feature in the novel ' Jeanne'. It dates from the 15th century and has guided tours. The town square is a beatiful ,peaceful area with a number of bars and cafes, all with outdoor seating . Perfect to whiling away a lazy afternoon. Lovely market every Thursday morning . A short distance out of town is Les Pierres Jaumatres. where you walk through woodlands and it brings you out to a formation of huge stones , formed by Volcanic eruptions. A true wonder. Nearby is the chateau at Culan. Sainte Severe- Sur - Indre _: The 17th market hall is now famous where it's wednesday market is held. There is also a 16th Century Calvane (Stone Cross) in the market square. One of the most important events that put the town on the map was when in 1947 JACQUES TATI who took refuse in the area in World War Two and filmed his debut feature film 'JOUR DE FETE'. Various festivals are on during the summer months and also many brocantes and markets. Close by is Les Claudits Donkey farm to visit and choose a donkey to ride or carriage rides by appointment. Ideal for all ages. Also in the same village a llama centre. Ideal area for cycling holidays, walking holidays, horse riding, fishing nearby. This is just outside Gueret set in the chabrieres forest and is devoted to the history and legend of these creatures and also has a park containing about 30 wolves. This lets you observe the behaviour at close range from purpose built observation towers. The park also has a planaterium and various displays showing the relationship between man and wolf. The area has many lovely walks, horse riding nearby.